Biking is a great way to burn calories and increase daily physical activity. Exercise is a key component to healthy living. People of all ages can reduce their risks of overweight and obesity, heart disease, stroke and certain types of cancers as well as improve their overall quality of life by engaging in daily physical activity. Biking is an exercise that is accessible and safe for nearly everyone. By incorporating biking into your daily routine, you can improve your health and well-being. The U.S. Department of Health and Human Services Physical Activity Guidelines for Americans recommends that adults pursue at least 30 minutes of moderate-intensity exercise five days a week. Moderate-intensity includes activities such as bike riding in addition to the light physical activity, such as cleaning, gardening and housework, that is part of everyday living. You can help reach your daily fitness goal with a 20-minute bike-riding session or in several shorter rides that total that amount of time. Biking provides numerous health benefits. The calories burned can help you to achieve and sustain a healthy body weight. The American College of Sports Medicine says biking is a low-impact, non-weight-bearing exercise that improves bone density, circulation and muscular endurance. The low-impact factor means that biking is safe for most people. Biking is associated with a host of other health benefits, such as alleviating depression and anxiety, reducing blood pressure, lowering total cholesterol levels, preventing type 2 diabetes and controlling blood sugar. The calories burned while biking for 20 minutes vary by individual. The main factors that influence calorie burn are your age and weight, as well as the duration and intensity of exercise. Individuals who weigh more will burn more calories biking in 20 minutes than those with lower body weight at similar intensities. You also can burn more calories if you engage in higher intensity and longer bike rides. Thus, keep in mind that the amount of calories you burn biking for 20 minutes is an approximation. You should estimate slightly more or slightly less depending on your physical attributes and the intensity of the 20-minute ride. On average, a 150-pound person burns 91 calories biking for 20 minutes at a leisurely pace of less than 10 miles per hour, according to the Calorie Control Council's Get Moving Calculator. 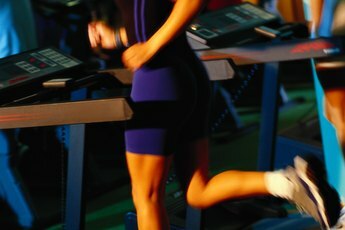 The caloric burn increases to 136 calories when intensity escalates to a moderate pace, 12 to 13.9 miles per hour. By comparison, at a moderate pace, a 120-pound person burns an estimated 109 calories in 20 minutes, while a 200-pound person burns 182 calories. While biking is safe for most people, certain diseases, disabilities, medications, and treatments might prevent individuals from performing weight-bearing physical activity and other types of exercise, including walking. Check with your physician before engaging in new physical activities and exercises. Biking for 20 minutes daily does not meet the Physical Activity Guidelines for Americans recommendations to exercise for at least 30 minutes daily, either in one continuous session or multiple 10 minute bouts throughout the day. So even if you start with 20 minutes of bike riding, your goal should be to engage in moderate-intensity exercise for at least 30 minutes on most days to achieve significant health benefits. 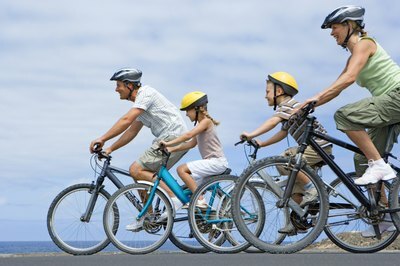 Always use appropriate safety gear, including a helmet, when biking outdoors. There are many ways to work more biking into your daily routine. Find a biking buddy through family members and friends and make your ride a time to laugh and socialize. Join a biking club in your community or start your own. If you belong to a gym or have an exercise bike at home, ride while watching your favorite TV programs. Jot down which strategies work for you. 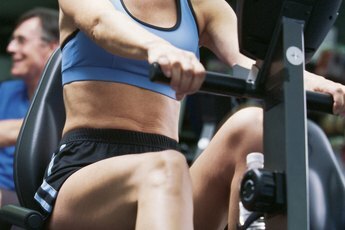 Create small exercise goals and work your way up to longer times and intensities.